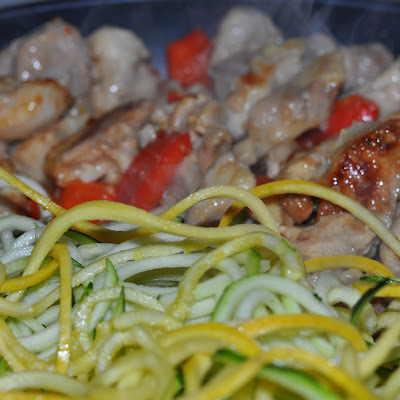 Zoodles??? Have you heard of them? No, they are not found in a Dr. Seuss book, at least I don't think they are, but they are growing in popularity on Pinterest and Foodie blogs, and they seem to be the next greatest thing since butter. 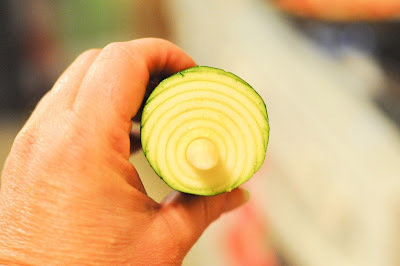 Why do I love these noodlely vegetables? They can totally replace pasta in the dishes I've been missing! After many many MANY years of trying to figure what foods "work" for me, the one consistent fact I see is that carbohydrates are NOT on that "good food" list. For me, these wheat and grain carbs mess with my joints and muscles, causing pain and inflammation. My tummy especially loves these grain carbs, and believe me, it shows! Can I give up all grains? Probably not, and I don't think I want to totally, but when I can find a delicious substitute for them like spiral veggies, I have no problem adding this sub to my menu! Ok, This recipe was found in the many pages of my brain, but you have cooked enough to know what you like on pasta zoodles right? Pesto, marinara sauce, Alfredo sauce, butter, meat, cheese.... the sky is the limit, but I happened to have some chicken thighs in the freezer, so off I went with them and some veggies! The only trick to making this simple meal is figuring out how you are going to turn squash into noodles. I checked around some of my friends' yummy blogs like Heather's Basilmomma and Lindsay's Pinch of Yum, and decided to try Veggetti Pro. It is a bit easier for me to use that the hour glass-looking types. 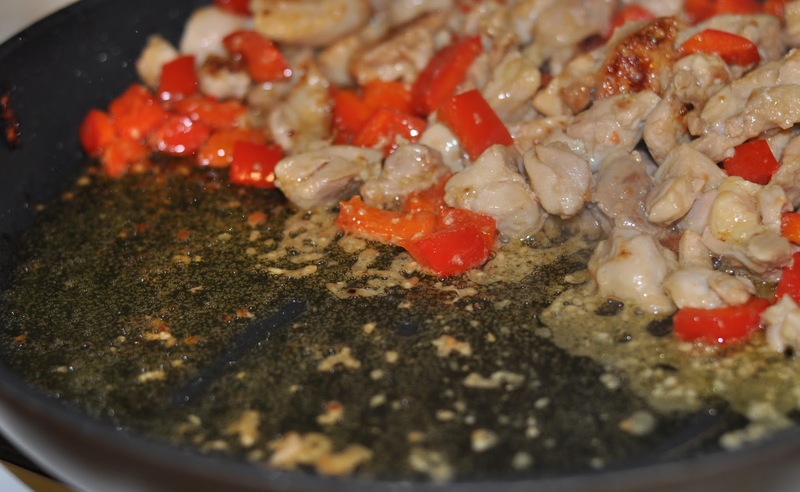 After you get the hang of it, and if I figured it out with one try you can too, chop up your chicken and veggies, warm up your oil and garlic in a large skillet, and you are ready to put this meal together and serve in about 15 minutes! 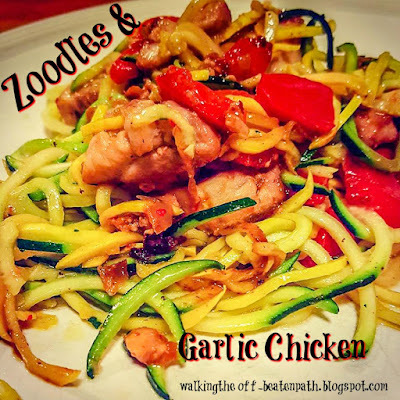 Once I had the chicken and veggies cooked the way we like, I scooted them over, and added the zoodles. Add the spiral zucchini and yellow squash, turn them over to coat in oil and warm up, and then you are ready to call in the troops. Supper is ready! Pour olive oil into a skillet, covering most of the bottom. Add minced garlic (to taste) into the oil, and let it cook on medium heat until it starts to sizzle. Add chicken and vegetables and let cook, stirring occasionally. 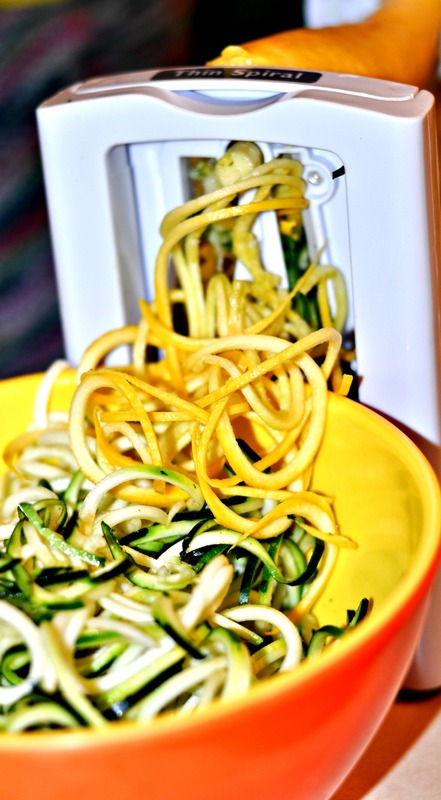 While the chicken and vegetables are cooking, grate the zucchini and squash on your Veggetti Pro or a stand up grater, grating the squash length-wise to get the noodle effect. Once the chicken and veggies are cooked through, scoot them to one side of the pan, and add the zoodles to the empty half. Let the zoodles warm up in the pan, turning them 4-5 times. Fill warm plates with zoodles, and add the chicken and vegetables on top of them.